In social and economic development, significance is primarily attributed to endogenous resources. The local conditions should play a key role in it. One of the characteristic features of the region and at the same time a key one is human capital which conditions the occurrence of creative capital. In the paper, creativity – as a resource appropriate to people, a feature of the individual – its potential for creative achievements currently or in the future will be analysed through the prism of creative capital. The aim of the article is to evaluate the conditions for the development of creative capital of the Podkarpackie municipalities in the context of their social and economic development. The evaluation will be made in regard to human resources. In order to achieve the goal of the study, the literature of the subject was analysed, numerical data published by the Central Statistical Office was used, and empirical studies were carried out in the offices of the Podkarpackie municipalities. The results of the conducted research showed that there are conditions favourable to the development of creative capital in the region. 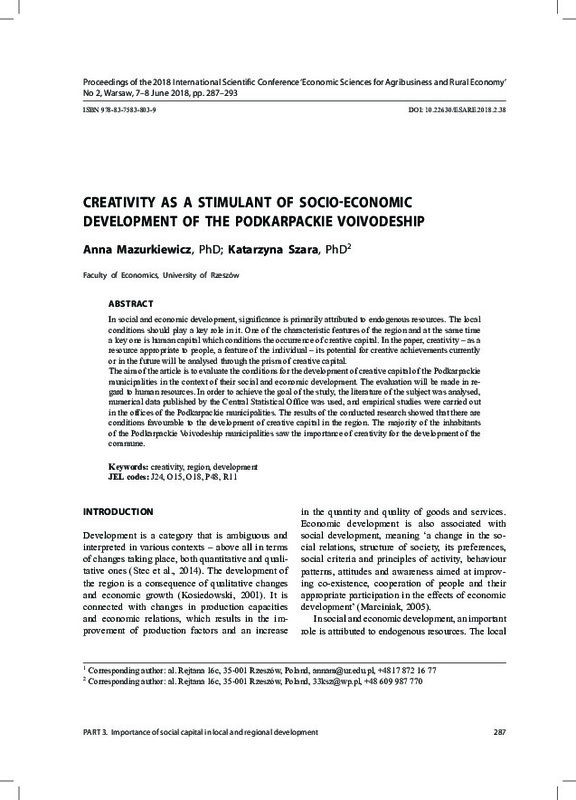 The majority of the inhabitants of the Podkarpackie Voivodeship municipalities saw the importance of creativity for the development of the commune.